I have lost a close creative pal and artist. I have lost too many of these fine story-telling partners in recent times. 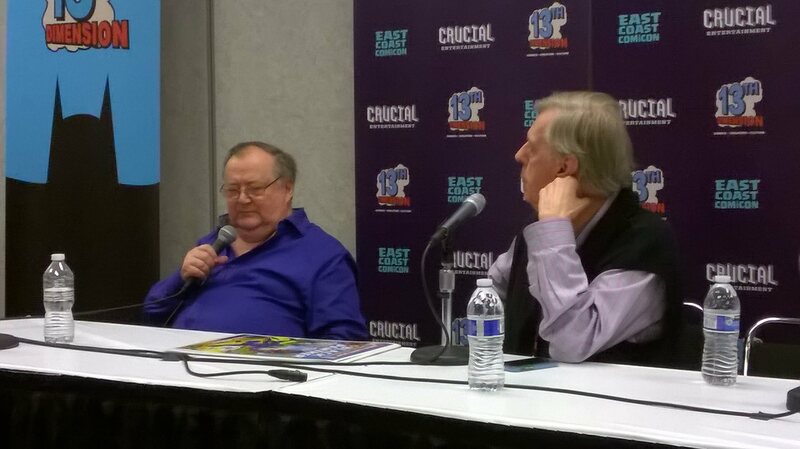 I have been fortunate to have people like Gene Colan and Billy Graham and Dwayne McDuffie in my life. And now, Rich Buckler is gone from the world. 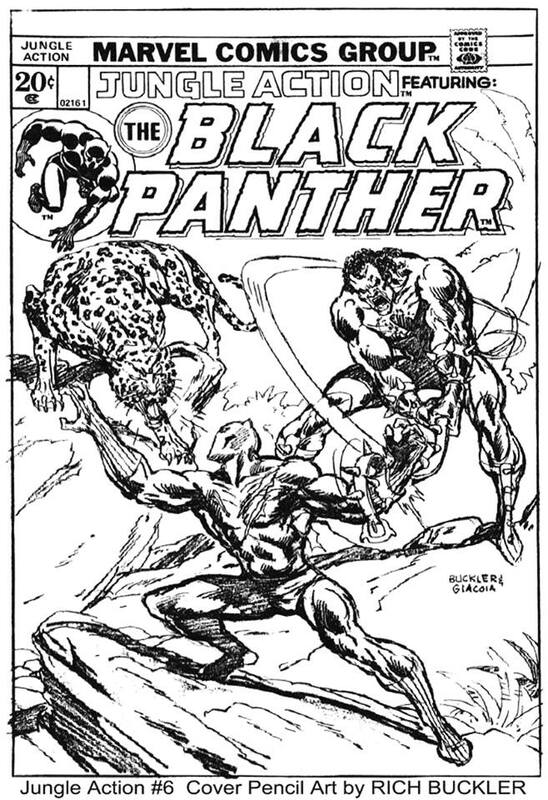 Rich was the first artist I got to work with side by side, sometimes almost on a daily basis, when I was given the reprint comic JUNGLE ACTION to write new stories about the Black Panther. 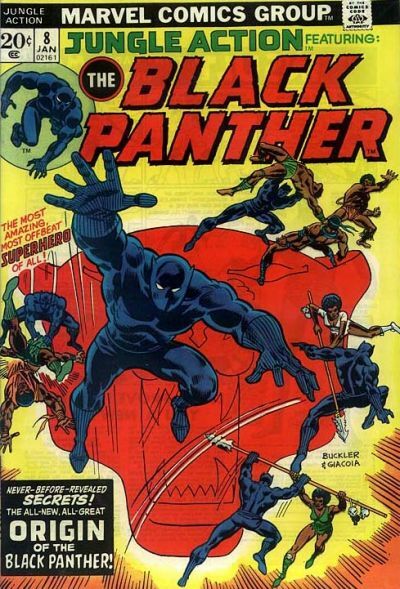 Rich was the artist on those first issues of PANTHER’S RAGE because Rich wanted to be there. That’s an important distinction to make. I did not have the power to say who the artist would be on my scripts in that time-frame. Marvel Editorial in 1973 assigned me to write the stories, telling the group where that decision was made, that jungle comics did not sell, and along with KILLRAVEN, because science fiction was also deigned to early death because that genre was considered DOA in the medium. The calculating chiefs in successive regimes could give a damn about Don McGregor, figuring these books had little chance of survival, and they’d have given me a chance to write, fulfilling an unspoken rule in the medium, that if a writer worked on staff, somewhere along the line you would have the person a chance to write. 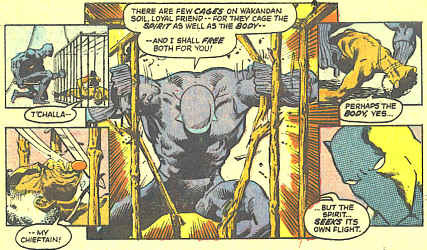 Rich Buckler, on the other hand, was a talent of considerable import to Marvel, and had his own office space in the Hallowed Halls. Rich did everything from high-profile titles to covers for many titles of the top tier. Rich and I met there in the early 1970s, and we immediately both became close allies. 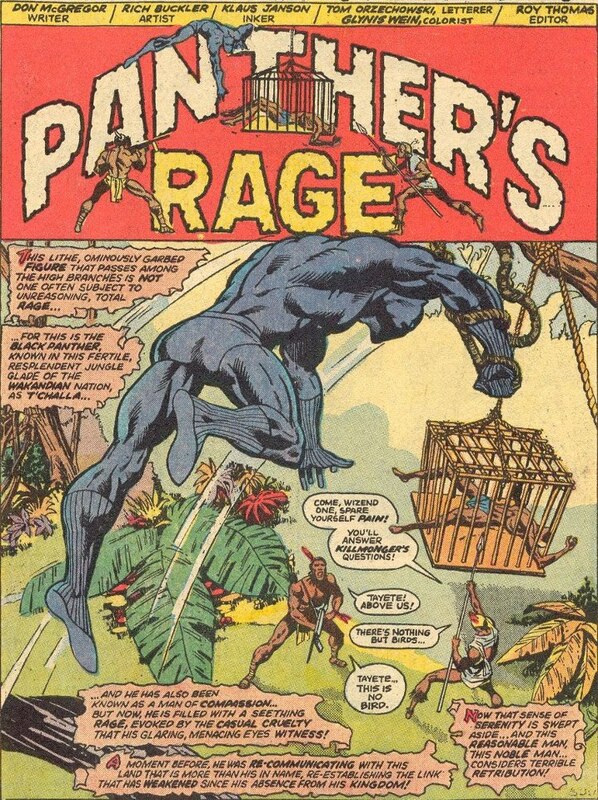 Rich said he wanted to be the artist for PANTHER’S RAGE, and since Rich was valuable to them for so many other titles, editorial heads reluctantly conceded to his desire for us to work together. If not for Rich’s insistence, and his support of me as a fledgling writer in the eyes of Editorial (who often weren’t enamored with my ability to tell a story despite having written many published stories of Warren Magazines), if Rich had not stated strongly that he wanted us to work together, he never would have been there for T’Challa’s return to Wakanda. 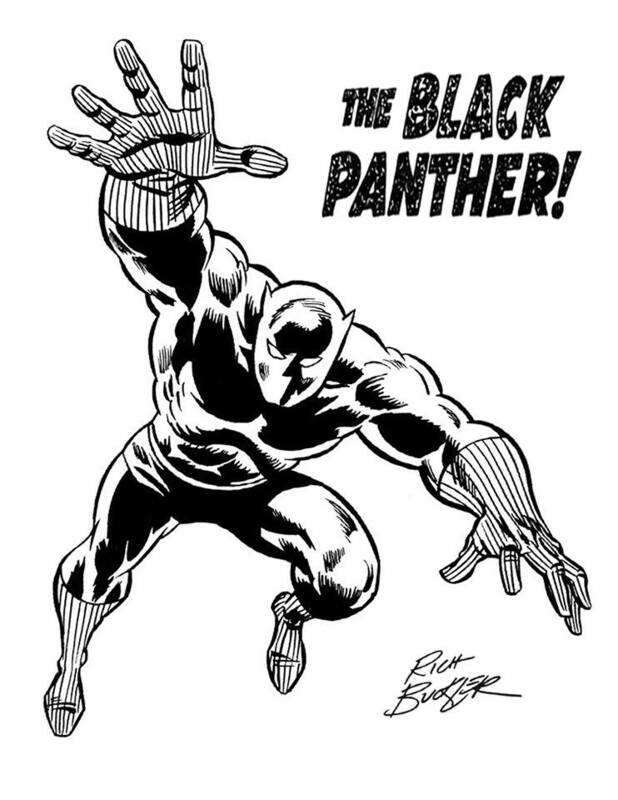 This was always a part of the Rich Buckler I knew; the man who worked hard to tell stories in comics, and who was loyal to his friends. He did not have to be there with me, but he chose to be. 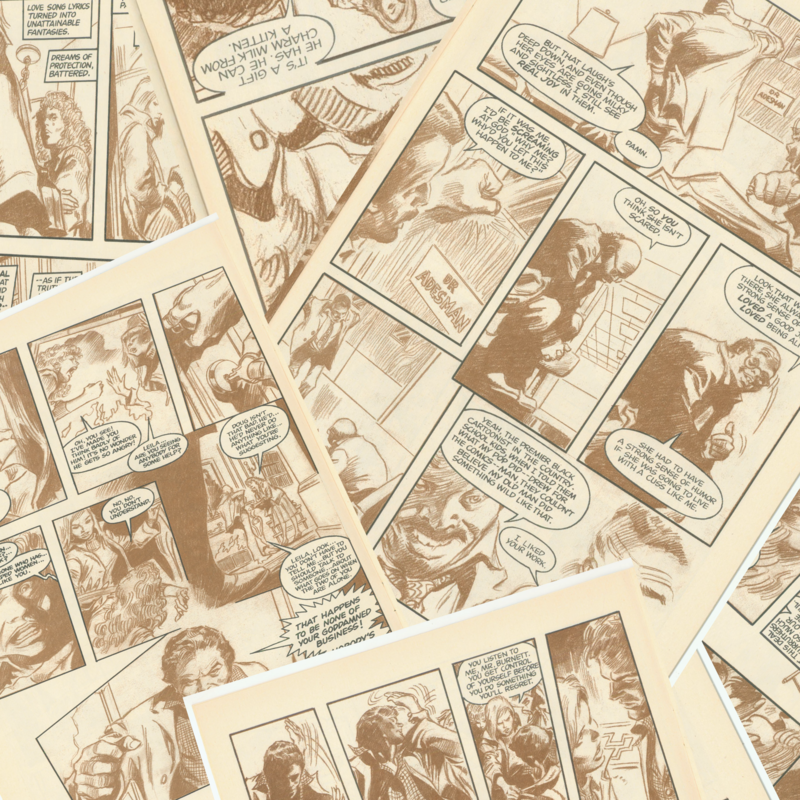 He wanted to be in a place where the boundaries of comics could be explored. Much of Rich’s life, in my experience with him was about exploration. Rich did not look for easy; he looked for work that would be a challenge and offer something unique. 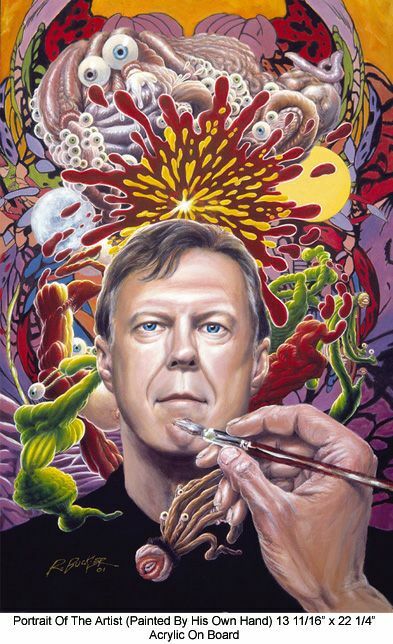 This is the Rich Buckler I know. Rich found me a place to live up on the Grand Concourse in the Bronx, near where he lived at the time, so that after hours at the bullpen, he and I could get together and work on those first three issues of PANTHER’S RAGE, and on HODIAH TWIST: THE PREYING MANTIS PRINCIPLE, and on MORBIUS, THE LIVING VAMPIRE. I would go to Rich’s apartment at night, sometimes even posing for Rich in positions I thought would best display T’Challa. The challenge to create became a synergistic energy between the two of us, and there was not an artistic challenge I could give to Rich that he would not try and make work visually. There were times that such focus and intense commitment would give Rich crippling migraine head-aches back then. I saw him suffer through them, pain lancing his eyes, but he would never let the pain stop him, and the results were often brilliantly executed. I have written this before, and I write it now, missing Rich, and that we will never have the chance to exchange ideas on Art and Life again. 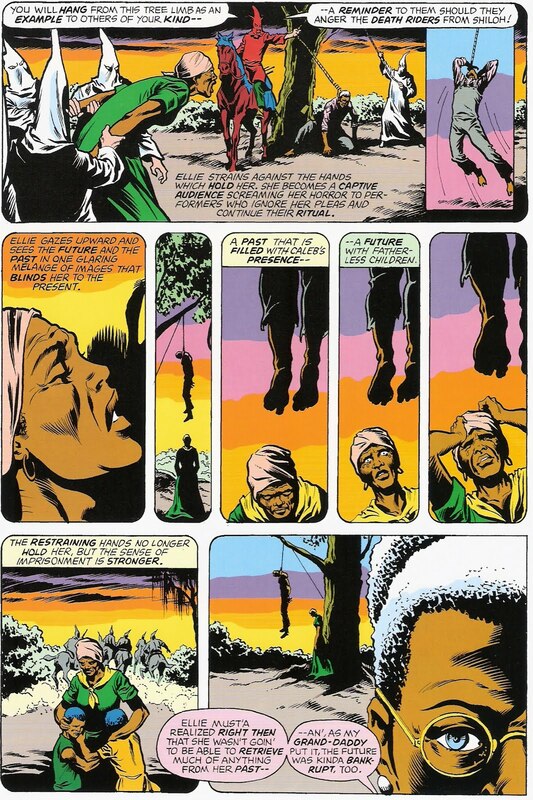 A writer in comics can bleed onto the blank sheet of paper (or now a white blank space in Word), but if the writer does not have an artist who believes as fervently in the importance of telling stories, and what we give the world with our talent, the no matter what inspiration or intent you have, it will be dead on the page. The effectiveness of a scene, no matter how emotionally or intellectually intended will have its power lessened. Rich worked diligently on those pages, and it was the first time I had the unique joy that can come from working side by side with an artist to tell stories. Anything I could come up with, Rich would embrace the challenge and bring it to illustrative life. Rich helped me with putting on my little dog and pony show that had little encouragement from the established editorial heads in that time-frame. Although I have not seen this mentioned anywhere, Rich embraced the diversity of characters in comics in the 70s. 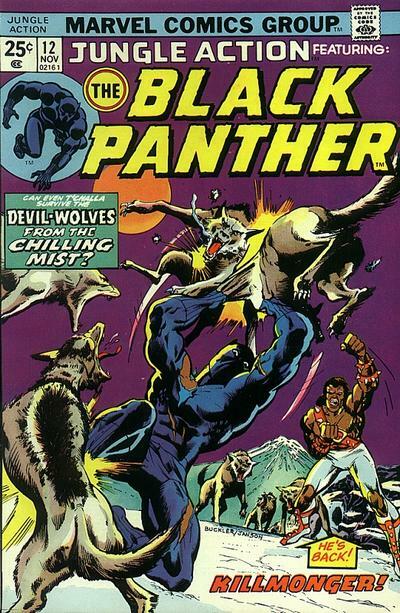 He also embraced diversity in his personal life, for a number of creators from artists like Denys Cowen, Arvell Jones, Keith Pollard, Klaus Janson, Tom Orz, from pencillers to inkers to letterers. Those kinds of questions were not uncommon in the hallways and offices of comics. Rich saw only the talent, and how difficult it could be to get a break into the business. Read Denys Cowan’s piece on Rich and his legacy to have some idea of what I mean. Rich and I worked on a script I had about a psychic detective, first called MICHAEL MONNIGAN and later SEBASTIAN EDGE, dealing with abortion, called THE MANIFESTATIONS OF MEREDITH BRYAN. I’m not sure where I planned to print this. I suspect Warren Magazines, but I also know it was being considered at Marvel during the end of my first sojourn at the company. Rich’s story-telling was so powerful, the ambiance ripe with fear and horror. It was never inked, and somewhere I still have the original art that Rich did that still holds that kind of emotional power today. 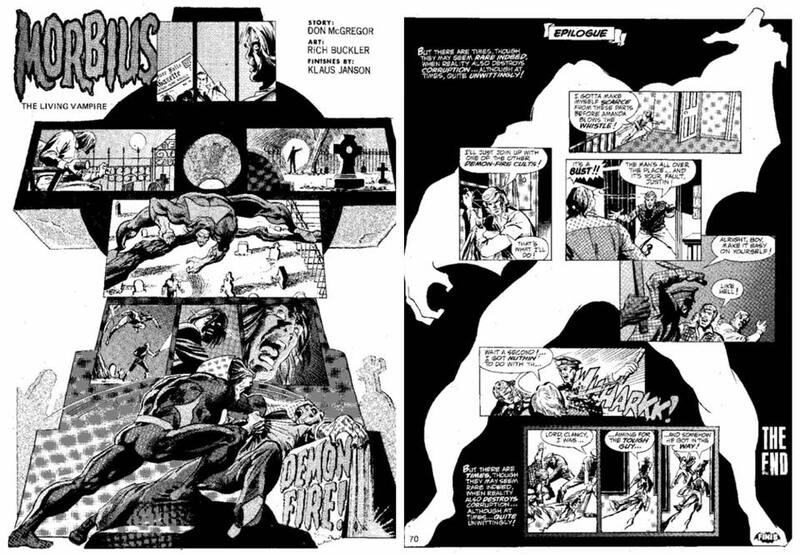 There are even a couple of DETECTIVES INC pages Rich did, on a story called THE NIGHT THEY DIED. 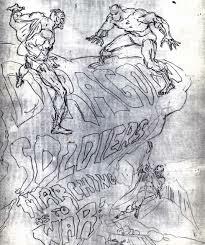 As far as I know only a couple of Xeroxes remain of Rich’s version of Denning and Rainier, done after Alexander Simmons first drew them in 1969, and before Marshall Rogers and Gene Colan brought them to comics life in the 1980s. Somewhere along the way, though we were both still in various places around the New York City arena, we lost track of each other. I don’t recall how we first re-met. 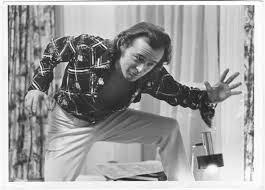 I do recall going to the office he had in mid-Manhattan and that was where I first saw his paintings. I also met his wife, Mila, for the first time, at her office next to Rich’s. 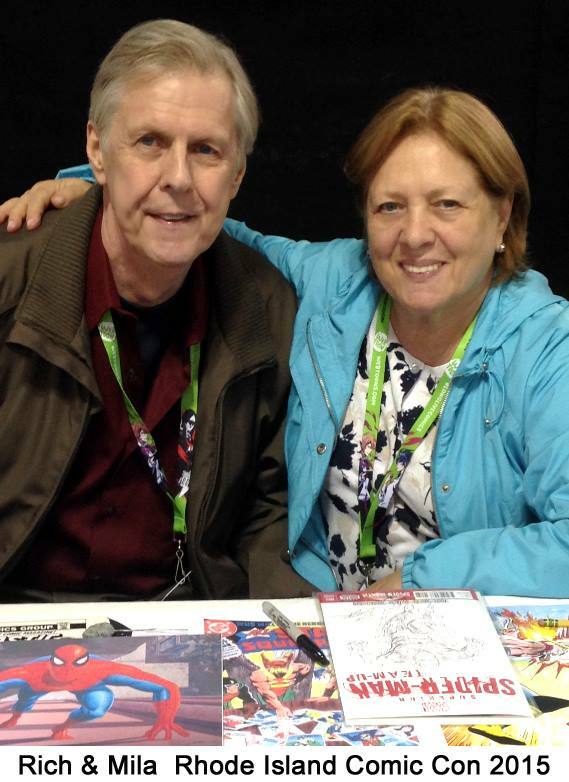 The four of us, when Marsha would come to Comic Cons with me, and Rich and Mila would sit beside us, would become us embracing anew in the last years of his life as partners and friends with common passions for comics. One of the first meetings I had with Rich after we’d lost contact with each other during the 1980s was at one of the first Manhattan Javitz Center Conventions. I don’t recall how we got in touch with each other, but I mention this because it show-cases how, so many years later, Rich was still helping other talent. I did not have a badge to get into the con (I don’t even remember why I was going there), but it was now during the time of cell phones, and Rich told me he would come out of the vast inside crowds, find me in the waiting area, and give me a badge so I could get in. I would return the badge to him so he could help a few others be able to gain access. Rich was still helping fellow talents in the field. In these last few years, Rich and I were often together. We talked on the phone. We wrote on each other’s Facebook pages. But best, we did a number of Comic Conventions together, and afterwards, no matter what state we were in, we’d find a place to have dinner together, and discuss comics and story-telling and movies, and all the things we loved. 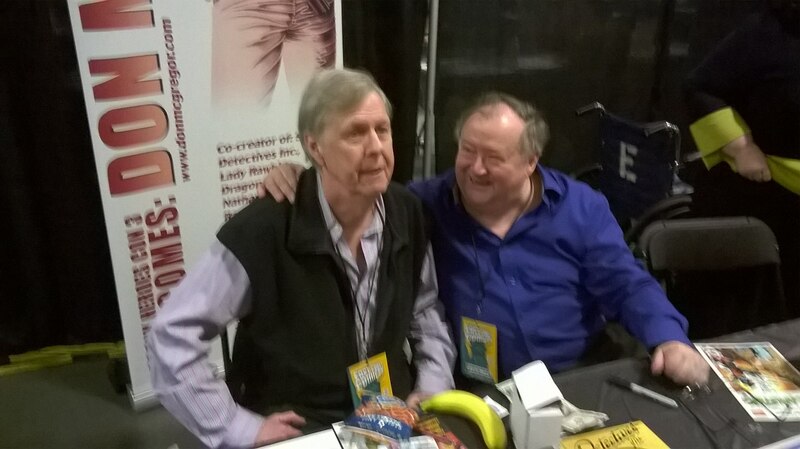 Rich badgered me when he learned I had never charged for an autograph. He told me the fans would not mind paying a few dollars for an autograph and knowing they were helping a creator whose work they enjoyed. I kept telling him in the beginning that I didn’t know how to do that. Rich drew a Panther image for me to sell at Comic Conventions. He designed ads that featured the both of us together. He wanted us to do panels together. 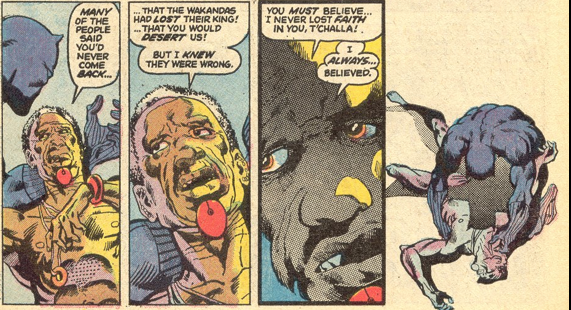 Once I met cos-player Bill Johnson, who was dressed as an impressive Black Panther, I said to Rich that we needed to have Bill’s T’Challa join us on stage. For those of you who got to see us together in El Paso, Texas, or at the Meadowlands in New Jersey doing panels, talking about not just the past, but the uniqueness of comics, and our times together giving everything we had to bring a book to reality that would be profoundly our own, for better or worse. A few months back Rich talked to me about doing a convention in Las Vegas, and once again letting the audience ask us any question they wanted. He would convince me we should do it, if I expressed any hesitation. Now, that future, with us sitting side-by-side, listening to each other tell our personal stories of survival in this biz , and of our intent as story-tellers and communicators, those panels Rich wanted to do will never happen. I will never hear his voice again. The world has diminished with the loss of an artist who cared and dared, and stood tall for comics and creators, even when he was in severe pain. We had many photographs taken together in the last couple of years, as our friendship was forged anew, of much delight to both of us during trying times of health onslaughts. When we were being photographed, many times by Mila, often by fans, Rich would try to get me to stand still. Most of the time I would find that impossible to do. It’s just not me. Never has been. But we had many fine photos together, that caught our interaction together. In his last year, before I moved out of the city boroughs, I picked Rich and Mila up at their place in Manhattan and we did comic convention in a casino near Kennedy airport. Rich was in pain that day, and as noon-time neared, he decided he could not stay the entire day. I was going to drive him and Mila back to the city, but before we could exit the convention hall the pain became so intense that the promoters had to call an ambulance. Suddenly I was alone at the table, worrying about Rich. After a couple of hours I decided it was so slow that I would head on home. I was taking the books off the table when Rich returned with Mila. Despite the pain, despite having to endure the hospital, his incredible will power and desire to create brought him back to the fans. I don’t believe I would have been able to do it. He drew commissions and sketches for the rest of the afternoon, and it was nightfall before we headed back to Manhattan. A few months ago, Rich had a long spell where he did not Post any art or comments on his Facebook page. For Rich not to endeavor to keep in contact with the fans who loved him, who did not work so diligently to keep awareness of his work alive, I knew it could not be a good sign. Only something so severe, so debilitating could keep him from what he loved to do and how to let people know not only what he had done, but what he was doing. I am honored by both Rich and Mila that I was one of the few Rich would talk with in the last couple of months. If he had energy to talk, Mila told me it would only be with me and Rick. I am moved that he trusted me so intensely, even in those last days. Marsha and I had to return to Brooklyn about a month back for two days. I could not come back to the area where Rich and Mila were and not visit them. I asked Mila if it was okay. I am so glad we did. I was afraid it might be the last time I would get to be side by side with Rich, to see him, to hear his voice. With everything he had been through in the past weeks, he still expounded on what it took to live a creative life, and fiercely, whatever tolls his body had taken upon him, he would endure to continue to express that Art. I had time to talk with Mila alone, as well, while Rich talked with Marsha, in a weakened voice, but one filled still filled with passion and conviction. Mila wanted me to see Rich’s variety of paintings and sculptures and styles. Her voice held sorrow and pride, sorrow for what was happening to her husband, pride for his talent, for his legacy. I am glad we went to see them. It was the last time I would see Rich. You hope it won’t be, yet are plagued with a knowledge that it could be, and there is not a damn thing you can do about it. I had told Mila that she could call me at any time. If I was not at the phone, I would call her back as soon as I could. I wrote a piece up on my Facebook page about positive thoughts for Rich. I did not reveal anything he or Mila would not want me to. I knew they knew I would not betray their faith in me But I had to do something once back in Rhode Island, and the only thing I felt I could do was send good will Rich’s way, without any devastating revelations. Mila left a message for me when I was in Philadelphia attending the East Coast Black Age of Comics Convention (ECBACC). I saw Mila’s name, and I knew immediately the day would change radically, that the excitement of attending the show and receiving the Award for Diversity was now covered with a bleak shadow that would turn solid as soon as I called her. Mila is a source of strength and accomplishment and endurance, I wouldn’t believe she was given to tears often, or of her voice breaking with intense loss, but I heard all these things as soon as we spoke. Rich was gone from her. Rich was lost to Marsha and I, and we would never hear his voice again. Rich had badgered me to do another convention, when I was, at best, conflicted about doing it. It was everything around it that seemed insurmountable, the packing of books and clothes, the travelling, the long lines at airports, the struggle to pull everything to the next stage of the trip until you are in the hotel room. The cons themselves: Rich was right. Who could complain? The readers always treated me with a kindness and enthusiasm for what we had done, what we had given to them with our work, our lives. Accepting the Award that night was an honor, and being with a group of enthusiastic lovers of comics and what the medium could and/or should be was envigorating. But we will always be able to view the Art he left behind.